Dubuque Skywalk: Skywalk between the Grand River Center and the adjacent hotel in Dubuque, Iowa.It might appear at first glance that I am anti-skywalk. And you would be right in most cases. I just found another egregious example in Dubuque, Iowa, of all places. More about this later. First a little background. 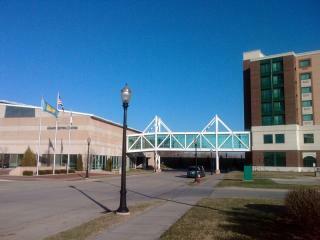 I am in Dubuque for a lead paint "visual risk assessor/sampling technician" training. After class today, I decided to take advantage of the beautiful spring weather and go for a self-guided tour of the downtown area. Downtown Dubuque is bordered on the west by the Mississippi River bluffs and on the east by Highway 61, which cuts between downtown and the industrial/recreational areas adjacent to the Mississippi River. The historic downtown is fabulous, and quite a bit larger than I anticipated. In general, the streets are quite pedestrian-friendly, with trees, wide sidewalks, and relatively dense development. Despite the obligatory gas station and drug store teardowns, much of the historic building fabric remains, running the full range from row houses to 6-story mixed-use walk-ups. Most of the storefronts appear to be occupied, though by the time I got there I was relegated to peering in windows.